We are giving away to one lucky winner all three sets in our new release – available here. However, if you have already purchased these 3 sets, you may then select ANY three Stamp Simply Clear Stamp Sets – available here. Just leave a comment on this blog post telling us what type of stamp sets YOU love. Thank you for joining us today and we hope you visit often. We will continue to provide samples with our NEW sets over the next couple weeks. Have a wonderful week ahead – and happy shopping! I love sentiment stamps and background stamps most of all. This release is perfect! that set is my favorite. I am always on the lookout for great sentiment stamps and all 3 are great. I really like all the religious /Christian sentiment stamps. The new stamp sets are amazing! I love them all and the sympathy ones are some I don’t have many of, but love the birthday set too and use most often, which is a good thing right? Not only are the verses fabulous, but the stamp designs are beautiful as well! I love the font on these stamp sets! I am all about sentiment stamps – especially birthdays and friendships. These new releases are gorgeous! My favorite stamps are sentiment stamps with beautiful fonts and I love all kinds of background stamps.. These new stamps are fabulous. Thank you for the opportunity to win these ..
It’s hard to pick a favorite. I like all the different choices of greetings in your stamps. I like a good sampling of greetings but probably birthday the most. I especially like the fonts in your stamps. Thanks for the chance to win. This is a great release and the cards are just beautiful. I struggle with sympathy sentiments and these will be perfect for those difficult cards. I love all your sentiment stamps, especially your three new sets. I have your first birthday set and have used that one a lot. I plan on getting your new birth set and I love the idea that the two can be used together . I love that you design your sets to be used this way. Also love the fonts, they are so graceful and pretty. Makes any card special. I like good sentiment stamps and florals. These stamp sets are gorgeous and will make any card stand out. These sets are wonderful. They would be perfect for our church card ministry. I am always looking for new sentiment sets. Hello ladies! I LOVE your sentiment stamp sets … they are great for the front of a card or for the inside sentiment. I have a couple sets that I continually turn too. These new sets are beautiful and on my wish list. Thanks for all you do and for sharing such wonderful inspiration! The fonts used on these sentiment stamp sets are just beautiful & graceful; love them!! These sets are beautiful!! I struggle with finding the right sympathy sentiment! I’m a lover of florals, paired up with a good sentiment. Sentiment stamps with combinations of pretty fonts are my favorite! These are great! I love sentiments with pretty mixed fonts that are good for both outside and inside the card. Love the elegance of these sympathy sets which gives so much choice on a card. My favorite type of sentiments are the “Thinking of you” type – they always work for most anything and the “innie outie” (inside-outside) concept! Thanks for the giveaway – seems I always need these kind of sentiments. I donate cards for our church and am always looking for new scripture verses, sentiments for all occasions. I really like the fonts used on these stamps! I shy away from making sympathy cards because I never feel like I can capture the depth of sorrow people are feeling when they have lost their loved ones. These stamps capture sentiments that would be appropriate for a meaningful, thoughtful sympathy card. Thank you for finding such lovely ways to express heartfelt sympathy, and thank you for an opportunity to win them. I always procrastinate when it comes to making a sympathy card and as we all know, they are many times needed at the last minute. Making a few ahead is always a great idea and seeing these beautiful sympathy sentiments will help me to get motivated. Knowing the card will look elegant and beautiful means a lot to me; just love the awesome fonts and sayings on these sets. Thanks for the chance to win them! Fabulous sentiment sets! I love the beautiful fonts! Lovely words of comfort in the sentiment sets and beautiful birthday sentiments as well! My favorite type of stamp sets would be animals, cats in particular! These sets look great! My favorite type of stamps are verses. You can never have too many of them. So pretty; just the right touch for a sympathy card. Some terrific sentiments there – great release! I am loving these sympathy sets it’s always so difficult to find the right words to express and you also include one for pets -fantastic. I would love to see another set for get well or feel better but not necessarily religious as although I appreciate these sentiments there are quite a few who shy away from them. These sets are amazing. Thanks for sharing and the chance to win. My favorites are sentiment stamps that are pretty, and that offer a message of hope and encouragement! Your sentiment stamps certainly tick all those boxes! They’re beautiful, and I’m so happy that Deborah introduced me to them! Thanks so much for the chance to win some of my own! Love great sentiment sets with great fonts! I love the farmhouse stamps. They are an exceptional value. 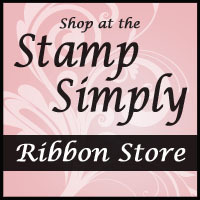 I love sentiment stamps that are pretty, and that offer a message of hope or encouragement! Your beautiful stamps tick all the boxes for me. I’m so glad that Deborah introduced me to them. Thanks so much for a chance to win some. I love all of these three – sentiments are my favorites (especially condolences). Thank you for the opportunity to win! I love stamps with images and pun or funny sentiments. But I also love flourished sentiments. Love the release. Sentiment stamps are some of my favorite. Always looking for nice and appropriate sympathy stamps. Thanks for a chance to win. I love big bold sentiment in various fonts and design especially birthday theme. Thank you for the chance to win such awesome prize! Awesome! I love animal stamps so I am always looking for new sentiment stamps to go with animals. Puns are fun! 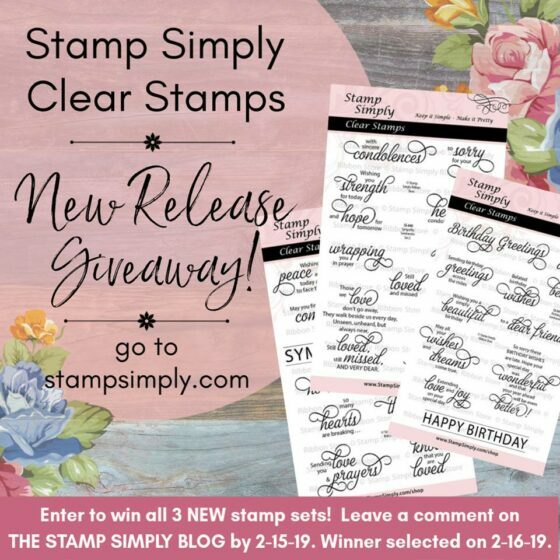 I would have to say that my favorite of the new release would have to be Stamp Simply Clear Stamps – Birthday Sentiments. All the new stuff is fantastic though to be honest. Happy Valentines day to you and yours! I love florals but anything pretty!! Your card is gorgeous. Also, I agree that sympathy cards are difficult. These new sentiments are perfect. I agree that sympathy cards should be simple and beautiful or simply beautiful. Since I love sentiment stamps so very much, these new stamps sets would be a great addition to my stash (if I’m lucky enough to win them)!!! I love sentiment and images to color stamps. Thank you for the opportunity to win some awesome stamps. I love your stamps, sentiment and images!!! They are beautiful and the different fonts used on the sentiments are beautiful! They all are just the right size to make beautiful cards! Thank you for the opportunity to win!! What a wonderful collection! It would make card making so much easier.